At Xtreme Garage™ we did not invent the garage door opener, we perfected it. Simple, reliable design; heavy-duty, high-quality components; and easy installation are what make Xtreme Garage™ garage door openers great. A garage door opener is something you depend on every day. For this reason, Xtreme Garage™ garage door openers have been engineered to operate in all temperatures, from hot summers to extreme winter conditions. 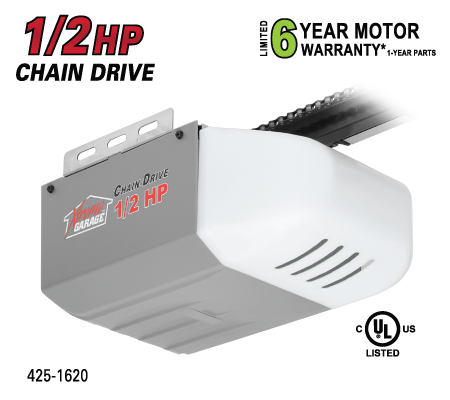 The 1/2-horsepower electric chain drive garage door opener is the entry-level opener offered by Xtreme Garage™. This opener is designed to handle most sectional garage doors up to seven feet tall and 18 feet wide. Powerful, 1/2 HP opener with heavy-duty chain drive system. Reduces wear & increases operating performance, even in low temperatures. Added peace of mind with Xtreme+Security. Protects your home by only responding to your personally programmed Xtreme Garage™ remote control. Install the opener. Follow the enclosed installation instructions to easily assemble and install your opener, optical safety sensors and illuminated wall button. Program the opener. Using a standard screwdriver, adjust the open/close travel limits. Us the push buttons to set the open/close force. *Before Set-Up: Measure your garage door. This acess system handles doors up to 18ft. wide and 7ft. tall. Optional extension kits (sold separately) are available for taller doors. *HomeLink and the HomeLink house are registered trademarks of Gentex Corporation. Watch this universal video to learn how to easily install an Xtreme Garage 1/2 hp opener. Always refer to your owner's manual during installation.